The card effect commonly known as the "Chicago Opener" has been ma Icing the rounds during the past few years. Practically every card man has a version in his repertoire. What I offer here is a new presentation and a very direct method. Begin with a red backed card face down on the bottom of a blue deck and have the matching blue card directly above it. Let's say that the two cards are the Four of Diamonds. You can now indulge in various false shuffles of a table riffle variety or a Hindu shuffle by pulling out a block of cards from the center and Hindu shuffling them back on top. I further delay the two card set up by performing one or two effects that do not require the bottom quarter of the deck. 1 usually perform Dai Vernon's excellent "Follow the Leader" from his small book "Select Secrets." This tises ten random red and ten random black cards which I take from the top of the deck. I set the balance of the deck aside and perform the effect with these twenty cards. At the conclusion of "Follow the Leader" I shuffle the twenty cards together and then deal ten of the cards back on top of the deck, saying that perhaps 1 am using too many cards. I now perform an effect of Alex Elmsley's called "Minor Triumph" with the remaining ten cards. This can be found on page 256 of his wonderful book "The Collected Works of Alex Elmsley Volume 1." "1 used to watch a lot of television back in the late fifties, particularly sporting events. I recall when the Instant Replay camera was introduced to enhance the viewing of these sporting events. I found the concept so interesting that I have developed a method of demonstrating Instant Replay with a pack of cards." Spread the pack between your hands, keeping the bottom few cards squared so as not to flash the red backed card. Have a spectator touch a card near the center. Place your left thumb on the back of the selected card and move the touched card and all those below it. forward for half the length of the selected card. Now move the cards below the selection back down even with the rest of the pack, thus out jogging the selected card. Now break the pack at the selection. I Iold the selection against the bottom of the right-hand spread with your right forefinger at the lower-right corner of the selection. Now place your left thumb on the face of the selection and your left fingers on the back of it, and turn the card face up, revolving it forward, away from you. (See Photo 2) Regrasp the face up selection with the right forefinger from below, at the lower right corner. Say, "You have selected the lack of Clubs." or whatever the card happens to be. 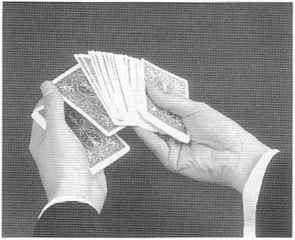 Now Hip the selection over face down, sideways, on top of the left hand packet and give this left hand packet a one-hand "CharlierCut" while holding the balance of the cards in the right hand. This places the red backed card and its blue mate right above the selection. Shove some of the right hand cards below the left hand block and some above it, thus placing the selection near the center of the deck. Riffle the front end of the pack with your right fingers for effect, and say: "There should be one red backed card in the pack." Spread through the pack until you come to the red backed card. Place all the cards above it into a neat pile on the table. While you are doing this, get set with a top two-card break with your left little finger. Perform a double turnover and the red backed card will show as a match to the selection. Turn the 'double' face down and toss the "red backed" card face down onto the table. Place the cards from your left hand onto die cards that are on the table and then pick up the deck. Say, "You touched the only card that matched the odd backed card in the deck! Now for the Instant Replay!" Spread the pack between vour hands and have another one touched. The blue backed match of the red backed card is now on the bottom of the deck. When a card is touched, outjog it as you did before, holding the selection against the spread with the right forefinger at the lower right corner of the card. What vou are going to do now, the Hexing of the corner and the turning face tip of the card, will appear the same as before, but actually a form of Mario's "Bottop Change" will be performed. For a complete description of the original Bottop Change, I refer you to Mario's excellent book "The Cardician," p. 33. The variation that I use here 1 believe is also Ed Mario's, and was shown to me by that excellent cardnian, Bill Malone. Bring your left hand forward with the lower half of the pack and flex the outer left-hand corner of the touched card. This is the same as before but you are going to exchange the bottom card of the pack, the blue backed Four of Diamonds, for the out-jogged touched card. 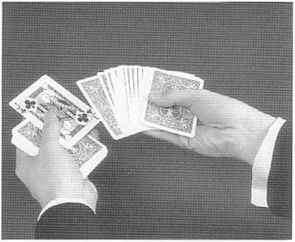 Loosen the bottom card by buckling it back and to the right with your left second finger, as if to perform a bottom deal. Take the bottom card with your right second finger against the bottom of the right-hand half of the deck and at the same time pull the otitjogged touched card flush onto the top of the left hand half of the deck. The action cannot be seen. It looks as if you just flexed the corner of the touched card. Now turn the outjogged card, the Four of Diamonds, face up, end for end as before. Tip the card over sideways onto the left hand half of the deck. Now place the right hand half of the deck onto die left hand half, burying the Four of Diamonds in the center. Pause, then start spreading the cards between your hands saying: "Since this is 'Instant Replay,' we should find a red-backed Four of Diamonds in the pack." Spread through all the cards and then spread through them again saying: " That's funny, there must be a red-backed Four of Diamonds someplace!" Now stop and look at the red-backed card on the table. Smile and wait. The spectator will turn over the card on the table and to his surprise will find die red backed Four of Diamonds. I think you will find, upon performing this, that it is a very direct method for this classic effect. It is one of mv favorites!